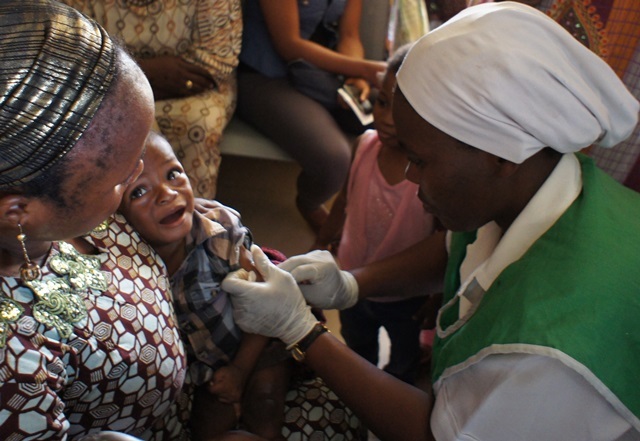 The nationwide measles immunization campaign was launched in Igbo Etiti Local Government Area of Enugu State by the wife of the Care-Taker Committee Chairman, Mrs. Nwanneka Agbo. The event, which took place at the premises of Ohodo Health Centre, was witnessed by some dignitaries, leading members of the council staff and people from the community. In her speech, Mrs. Agbo observed that since good health was a paramount need, it was logical to institute a process that would ensure sound health for the citizenry. She called on mothers never to joke with their health and that of their children regardless of financial constraints. She told the women the government of Enugu state, as was promised by the First Lady and the wife of the Governor of the state, Mrs. Eunice Ugwuanyi, was committed to the sound health of mother and child in the state. She harped on the importance of women to avail themselves of the opportunities of immunization that was free to them, for their sake and that of their children. She said: “Please, any time the government schedules immunization, come out, remind your neighbour and give your children the opportunity to live a healthy life. “If a child is not well, his mother cannot be well too. Mrs. Agbo later formally flagged off the programme by assisting the health workers in immunizing a child. The state Commissioner for Health, Dr. Samuel Ngwu, represented by Ikechukwu Nwangwu, the state Technical Facilitator on Immunization Programme for Igbo Etiti Local Government Area, enumerated the debilitating effects of measles on children which he said included blindness, deafness and sometimes death. Ngwu pleaded with the leaders of the community to always do much in mobilizing the people to embrace the life-saving practice of total immunization of their children against the child killer diseases the government had been battling to eliminate. The Igwe of Ohodo and the Abba III of Ohodo Abba, Chief Fidelis Isiwu, while commending the government for bringing such important health event to his domain, assured the government that his subjects would always take advantage of such programmes by co-operating with health workers in the community as nothing was more important than health. Isiwu expressed his delight that the government thought it wise to target such a deadly disease as measles, challenging every mother to give her young children the opportunity of a measles-free life. He promised the community would not lag behind in adequate enlightenment campaign whenever such programmes were to be carried out. Other dignitaries at the event, some of whom spoke and supported the campaign, included F.O Ajibo, Head of Personnel Management of the local government; Simon Abugu, Head of Department, Health; Sir G.C. Ozioko, the Disease Surveillance Officer of the council; and Johnson Ugwele, the Chairman Health Committee, Achara-Ohodo, among others. The women sang in delight and in praise of the first lady and the government for extending the campaign to their door steps. They were later entertained with some light refreshments and presented with souvenirs. Why Do You Laugh at Fr. Mbaka’s Utterances? Ebonyi State Born Dr. Jude Obasi Nkama Becomes The First African Judge In Newark, New Jersey.